Whether you’re a seasoned professional, brand new, or just curious about science writing—you’ll want to meet Adam Aston, Alison Fromme, Emily Gertz, Andreas von Bubnoff, and Sarah Webb, contributors to the brand new book, The Science Writers’ Handbook: Everything You Need To Know To Pitch, Publish And Prosper In The Digital Age. They will share personal stories from the trenches of science writing — tales of frustration, victory, danger, and more. 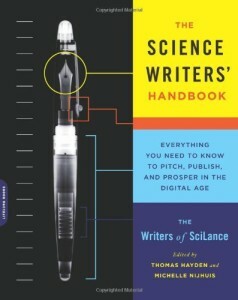 Afterwards, the crew will address how-to questions about building a sustainable and sane science writing career. We’ll discuss topics such as finding and crafting a story, pitching to publications, understanding business structures, negotiating contracts, handling ethical matters, and dealing with emotional issues like isolation and envy, work–life balance. Come chat, share, and learn. We’ll serve light refreshments and have books available for sale.